Why do birds sing? Beyond what can easily be explained, why do they come to possess such complex songs? Since Darwin , it is received wisdom that living beings in existence today have been the fittest to survive; they are better adapted to the world they live in than those that have not survived. One of biology's tasks, therefore, is to explain why living beings live as they do, or have the characteristics that help survival. Take the giant panda. Its lifestyle seems perverse; continuously eating bamboo, which it can digest only poorly. But as it had no competitors in its habitat the benefit to survival being unchallenged (until Man upset the balance) was greater than the cost of having to eat all the hours God sends. In the present generation, the orthodoxy has become that living beings are ‘containers' for their genes – it is the genes that do their best to program their animal containers. It is not the animals trying to survive as such, in other words, but their genes. Richard Dawkins is easily the best known exponent of such beliefs. Humans, uniquely, have reasoned intentions and strategies, and are also able to transmit cultural values – we may think of these features and values as existing in small units (termed memes), the cultural equivalent of genes. We may use the notion of memes, of transmitting culture, as a means of explaining why humans, unlike other animals, are not completely constrained by the selective processes of evolution. But we are left with trying to explain those elements of non-humans that do not fit neatly into supporting survival. Birdsong as such has many obvious uses – helping birds to define territory, attract mates and escape predators; but the extent and sophistication of birdsong seems to go beyond what can be explained simply. 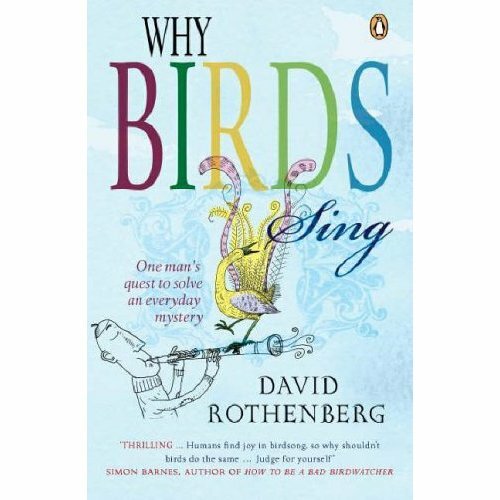 David Rothenberg has written a book pointing out that scientists, unable to explain why birdsong is so much more complex than it needs to be, change the question to How birds sing. He in turn is better at describing What birds sing. He describes lovingly the correspondences between birdsong and poetry, birdsong and music (Messiaen is by far the best-known example) and his own experiences of making music alongside birdsong. There are chapters on how to record and notate birdsong, how birdsong has become expressed within art music, and how birds have incorporated human music into their own songs. In turn, Rothenberg tries to avoid the opposite extreme of explanation – anthropomorphism. At the start of the book, he quotes the famous conclusion of the philosopher Thomas Nagel that we cannot know what it is like to be a bat, only what we would feel if we (humans) were bats. He spends much of the rest of the book not to fall into the trap of telling us what birds feel . In the end, says Rothenberg, birdsong has the same status as human culture, it contains an ineffable residue that resists scientific definition. The explanation of birdsong is infinitely less rich than the experience of it. This is not , therefore, a book on why birds sing at all. It is a celebration of the fact they do. We simply do not know, as Rothenberg admits at the start, if birds have notions of aesthetic pleasure at all comparable to our own. But he hopes, and rhetorically presents the idea that they do. Those who have a cultural interest in birds, birdsong and their influence on music will love this book. But don't buy it if you are seeking an answer to the implied question in its title.